This is Hazelleo living in Bendemeer/Boon Keng. I work in Bugis. I like to hang out in Bugis, Raffles Place, Outram. Japanese, Korean, International are my favorite cuisines. I also love Bakery, Café, Restaurant and Seafood, Sushi/Sashimi, Omakase, Desserts. It has been a while since my last OpenRice tasting. This time round is at CATO , the modern Asian restaurant and bar located just opposite the Sri Mariamman Temple. 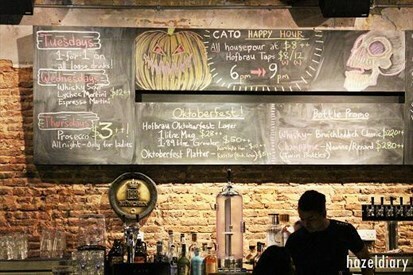 CATO offers an extensive list of craft beers, spirits and quirky tapas or bar bites. The 4 months old (opened on July 2015) is well-known with its craft beers but we are here to try their food for this session instead. CATO occupied the first and second level of the shop house. 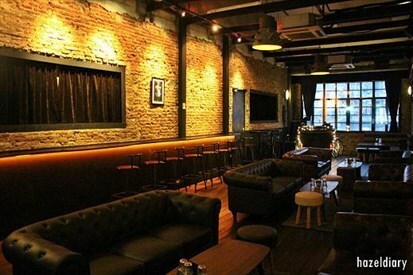 The first level is the restaurant concept theme while the second level is in bar concept. We had our session at second level where the interior designs are rustic style with rough brick walls and wooden flooring. And the lighing at the bar was very dim so for those who opt for food photography, I would suggest to just relax with the music in-house, foods and drinks. Set aside on the photography! The description of the dish pretty much explains the ingredients in the broth. 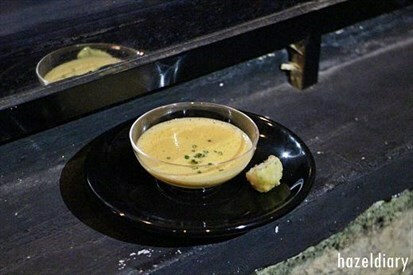 The broth was prepared using the prawn stock and the cod fish ball added in to give a good start to chill as a bar snack. It comes in a size as an espresso cup. 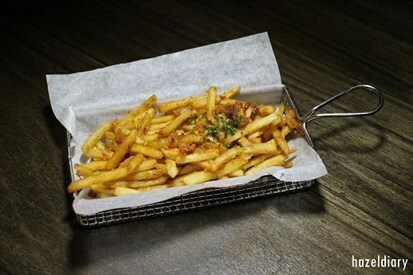 The fries served with roasted garlic and Cajun seasoning. I find the garlic taste was overwhelming but some find it not. Thus, it depends on individual preferences. Trust me! If you are not a spicy lover, you may want to skip this. I took the first bite and I can immediately feel the numb at my mouth and my throat is burning hot! So, be sure you inform the staff if you want the spiciness level to cut down. Fresh whole baby squid coated in flour and spice batter and seasoned with fish sauce before deep frying it. 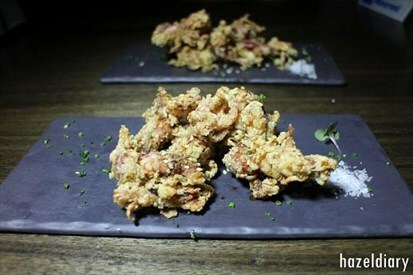 I would prefer to enjoy it with less batter so that I am able to taste the meaty squid in it. Neverthless, it’s a good order to go with beers. 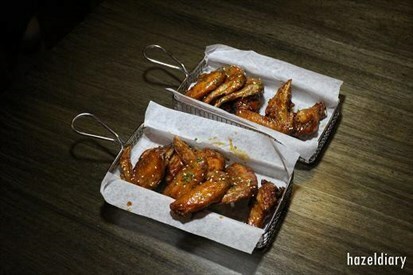 Mild chili wings with slight sweetness taste at the outer layer of the skin. 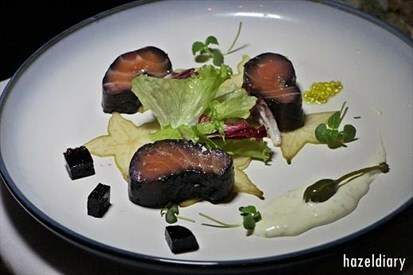 Salmon was served in big cube chunks together with marinated starfruit, ceyhice and acai jelly. 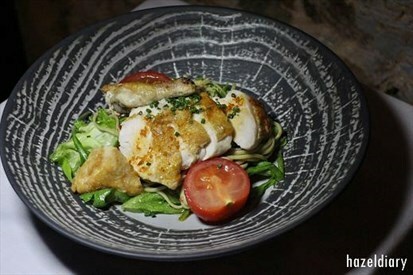 Too many flavours in the plate and I cannot really find the focus taste of this dish. 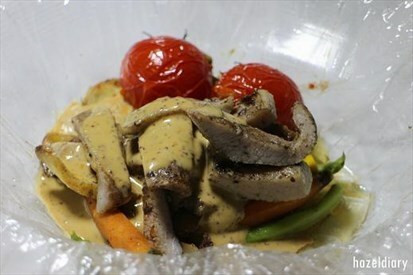 Tender pork cheek wrapped with a fata cooking oil along with seasonal vegetables. There is an Aladdin lamp shape jar filled with mushroom and port wine mustard sauce at the side. The pork cheek was tender and juicy and the sauce enhanced the flavour of the meat. This is highly recommended as it’s the secret recipe by the Chef’s family member. 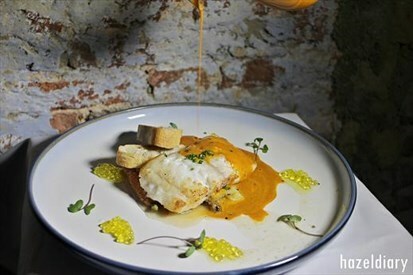 The fish that they used was New Zealand Ling fish along with the okra , eggplant, carrots, yellow squash, olive infused caviar, chunks of breads and garnished with fried onions. The curry was made from stretch was thick and solid savory. Beautifully plated on a nice round plate was served on the table. 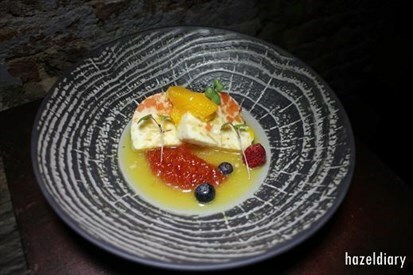 The nougat is homemade and topped with fresh fruits of papaya. raspberries, blueberries and caramelized almond. Fruity taste as whole. Chocolate cake served with almond ice-cream and some fresh pomegranate in between the plating. 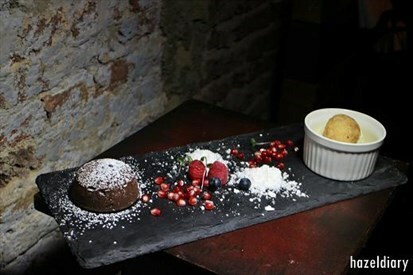 Although the chocolate lava cake does not flow as we expected, the chocolate cake was moist and rich flavour. I enjoyed having it with the pomegranate at the side. Plus, you will never go wrong to pair it with a scoop of ice-cream. Overall there are some hits and misses on the dishes but if you are looking for a good place to chill out, CATO bar would be an ideal option as their specialty on craft beers were well-received. On top of these, they also have the S$1.00 special for fresh oysters starting 6pm on Wednesday Specials.